Dismantling the federal government’s role could put into place the very conditions that would in turn give rise to a far more oppressive and expansive government. I think there is a simpler, and perhaps more elegant, if less theoretically grounded, way to express the conundrum you describe is this: the standard conservative account of the rise of the welfare state is heavy on the will to power of intellectuals and bureaucrats. And sure, that’s part of the story. But politically, they wouldn’t have gone far, if not for the fact that people were hungry in the 1930s, worried they can’t afford modern medicine in the 1960s, and terrified about the water they drank in the 1970s, and, if climate scientists are correct, freaked out about climate change in the 2020s. The government is not (just) a philosophical construct, or a power-sucking machinery- it’s also a mechanism by which complex moderns societies resolve the hyper-complex problems they generate. The defeat of the conservative intellectuals at the hands of a clown who nevertheless grasped that people want the government to solve problems is a case in point- and amazingly, said clown proceeded to give the keys to the kingdom to Mulvaney and his Heritage inspired abstractions.. This is a terribly vague and abstract essay. While I agree with most that it put forward, I still find it unconvincing. The argument could gain much more traction and possibly provide much more utility if the author made an effort to provide concrete examples and examine putative counterexamples. It is a constant refrain along the dial of conservative talk radio, and has regularly been a rallying cry of Republican leadership in Washington. The cultural decay in America makes anything like this unrealistic. Large swaths of Americans barely qualify as rational. Sadly, many are barely able to qualify as Human on both sides of the aisle. It is too late to cut the Federal govt out of many things. Many people think things that are supposed to be an aide are now a “right.” Corporate America has all but gutted most of the wealth from those they are trying to market to. The average American will not accept the pains associated with the changes needed to correct things. Corporate America will not accept bottom-line decreases. You are correct in that what is to come will be even worse. Short version: Be careful what you wish for! This underlines the point which applies to anyone who wants “change” – left or right – you can never be sure what the consequences will be of your actions. Real conservatives always understand this. I am not a conservative myself but understand the importance of a sceptical viewpoint. There’s one important difference between the state and the “intermediate associations”, the problem of Membership. Enlightenment (i.e. Pre Rousseau) intellectuals understood this very well. The intermediate associations established their own requirements about who could, or couldn’t join. Some, like the nobility, you had to be born into. Other’s like the Church, required you to publicly -no matter your private, real, beliefs- assent to their principles (on pain of excommunication, so to speak). Guilds, another common example, restricted very closely who and how could join, to protect the benefits that accrued to their members. The result was vast numbers of people that were excluded from every intermediate association around them. French philosophers -and, to its credit, the French Crown (*)- recognized that the state was the only association to which everyone belonged, and no one could be excluded from, and therefore, it was the state’s duty to protect citizens and promote their interests, sometimes against the interests of particular intermediate associations. The absolutist reforms of Richelieu, Mazarin, and Louis XIV were aimed at breaking the hold that a plethora of intermediate associations (nobility, old states privileges, feudal obligations, guilds) had over the vast majority of the -unaffiliated- population. The King’s Justice was a relief for the masses that before had been subject to the power that intermediate associations hold for the benefit of a limited number of associates. The American conservative dream has always had a failure of empathy. They rarely seem to consider the challenges for those that are not them. So nice of you to be concerned what the budget will do to your nice principles. Can you at least spare a thought to all the families that will go hungry because their food stamps had been cut? All those who will now do without medical treatment? But hey, you got a Supreme Court justice, so why complain? This essay outlines one of my concerns for about the past twenty years. The GOP keeps pulling the pendulum further and further right. The further right it goes, the more severely to the left it will swing when it does inevitably swing. The far Left can be just as debilitating to a nation as the far Right. The GOP/Right wing are currently utterly closed minded ideologues with no eye towards reality or pragmatism. Whatever happened to valuing moderation and compromise? 2. “Conservatives” (really, just the GOP, a shadow of conservatism) won’t be given much time, especially if they cause the withdrawal of the government from the public square. 3. Mediating institutions will take too long to come back and fulfill the void left by the state’s withdrawal. Makes some sense, but then what’s the solution? Don’t ever cut down on the Fed. Government? 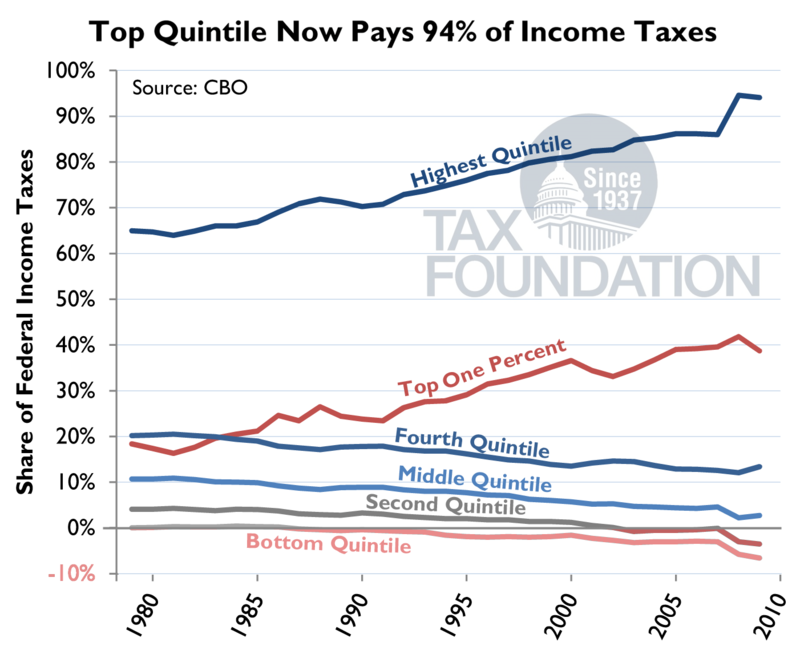 Reminds me of the talking point about the right just wanting to give “tax cuts” to the rich, while ignoring the reality of the ever-increasing tax burden on the top earners. There’s never a discussion on, how much government (and taxes on the rich) is enough, and if there can ever be too much? So a large portion of the problem lies with the media representation of the whole scene. Look at the Obama spike. Tell me why that’s good and necessary? It seems to simply be assumed that taxing the wealthy “more”, indefinitely (or at least until we hit European levels of taxation), is a good thing. It’s good to put talk of cutting Federal revenues into proper perspective. In short, conservatives aren’t going to really cut the Federal government out of the public square to any meaningful degree, though it will definitely be framed that way in public discourse. The logical end of ever increasing military budgets at the cost of everything else is a military state. To think that all the gaps left by state retraction will be filled by the market and/or traditional social institutions is naïve at best and shamefully apathetic at worst. There are many individuals and institutions who have the financial capital and the know-how to keep failing communities alive, but there’s little financial incentive for them to do so. The people are not their constituents, they are dollar signs. This is why government is not a business. This is also why as long as the GOP is the ‘Business Party’ they will never be truly conservative. Business is expansive, speculative, ruthless; it conserves nothing but perpetual profit and overthrows everything in its way to get it. We need stronger social institutions for no other reason than we need better people, who in turn give us a better business culture, one in which it’s possible for private life and public life to be in sync without misguided solipsistic justifications. The problem, as it always is, is that it has to start at the bottom, with the people. The state can roll back, but if it isn’t initiated by the people, then it won’t be adopted. And yes, there will be significant re-expansion if it fails. All the better not to fail. This already occurred in the past 10 years. From Moral Majorities, Christian Coalitions, and “Values Voters” to Social Justice Warriors run amok. This itself was probably a response to the sexual / social / liberal revolutions of the 60s and 70s, which apparently were a response to the “white-bread” conformism of the 50s… and on and on. The folly of Man – knee-jerk reactions and extremism begetting extremism. So, basically this boils down to the fact that our founding fathers gave us a republic suitable to Christian people and wholly unsuitable for any other. The end result is that our society has dechristianized and mediating institutions between the individual and the state have lost their power. This is probably true, but it gives no grounds to criticize attempts to decentralize power on the basis that intrusive government would follow, because it is a given that intrusive and totalitarian government is already the likeliest outcome we face. We really have nothing to lose from trying. Great article and post. Thank you. I’ve often been concerned by just this situation. The clear answer to me is to move the funding and benefits from the federal government to the most local city or county government. We may still have some liberal programs, but they will be seen as coming from local institutions. Local governments are great at creating intermediate institutions with their own boards and constituents, and are far more influenced by local churches, businesses and other organizations. However, let’s not forget that people rely on government because the local associations failed to actually meet the real needs of people. Locally, I work with a church group that reconditions the houses of elderly poor folks who can’t do the work themselves or afford to hire contractors. The County provides us with the names and addresses of people in need, provides the permits and funds most of the materials, and we do the work for free. We love helping some wonderful people and get a real feeling for the value we bring our community. This article demonstrates why I view TAC as the most important voice of Conservatives in the vein of Buckley. I am very liberal but I can appreciate the reasoning behind authors points here. They make complete sense to me. One thing that I do know, as most of you do too, is that the US is the richest country in the world. If we as a nation cannot provide for our citizens living on the edge of poverty what good is the US? I loved today’s hot comment by the Trump administration “We must have compassion for the wealthy also.” Face palm. I am an expert in technology. No company in that field supports the Federal governments stated attempt to lower funding for research. And our most successful and profitable companies cannot lead the world if not for all of the research and the resulting patents originating from Federal government funded research occurring in our nations universities. Thanks to everyone who has commented on my article, and thanks to the American Conservative for publishing it. Lots of food for thought in all the comments. Fleshing out some concrete examples would be an important step in making my case (this article was intended as an initial foray into the topic); highlighting the problems and difficulties with intermediate associations as a framework for establishing political society is certainly worth noting (in this complex world of ours, where is a strong federal government necessary? ); and to what extent are some of the underlying philosophical assumptions that we (conservative, liberal, libertarian, etc.) take for granted flawed, or at least representative of half truths? All important insights that I appreciate. thanks. The growth of government involvement in social matters came about directly because the lower-level “intermediate associations” failed to provide protection and care to broad sections of society. associations are explicitly exclusive. For example, the explosive growth of private “Christian” schools in the 1970s was a response to desegregation of public schools nationally. These “Christian” schools were an end run around desegregation, providing a “whites only” alternative to public schools. Over subsequent decades, local exclusive policies toward the physical and mentally handicapped in schools led to more Federal intervention. It’s a mistake to think that “intermediate associations” provide more care, opportunities, or liberty, to individuals. On balance, they don’t. Nothing prevents these associations from retaking control of local issues. “Sanctuary” cities, Habitat for Humanity, decriminalizing of marijuana use, are examples of local action subverting the pressure of government action. In the end, however, intermediate associations will continue to be the main means of expression for exclusive ideas and ideals. And that reality will make necessary government intervention in social matters. Anyone who thinks that smaller, “intermediate” associations provide more freedom, or opportunities to individuals has never dealt with a homeowner’s association. The federal response to poverty that started during the 30’s filled a a void unmet by states, counties, cities, towns or non government associations. That void was driven by economics, social Darwinism and racism. It’s not at all obvious that local response to poverty and lack of affordable healthcare would be different today than it was 80 years ago.